For 18 months, Dave Ross surfed forums and blogs and dreaded what he'd find. He couldn't tell his kids what he was working on, lest they say something at school. Every day, when Ross booted up his computer at EA Sports, he clicked on the shared drive over the studio's intranet, and then on the folder marked MADDEN PLAYBOOK CREATOR. "Madden Playbook Creator," in reality, was NFL Blitz. Revealed at last this week, NFL Blitz came as a nearly flawless surprise. In an industry permeated with whispers and scuttlebutt, and enthusiasts who scan domain registries and LinkedIn resumes for hints of unannounced products, Blitz's 18-month production cycle proceeded in almost total silence up to Tuesday's announcement. The high-definition reboot of the beloved 1990s arcade football title is due for a January release. "There have been times where we've seen speculation of what we were working on, especially with NBA Jam out there," said Ross, Blitz's project lead. Jam, like Blitz, came to EA Sports in Midway Games' 2009 liquidation, and the creator of both, Mark Turmell, worked for the label until July. To my knowledge, just one rumor, by now nearly a year old, presaged NFL Blitz's return. Giant Bomb's Jeff Gerstmann, in November of last year, got a tip from an "industry insider," then connected some dots and found that NFL Blitz had also changed hands to EA along with the by-then-known NBA Jam. Gerstmann reported what he knew and got the standard no-comment for rumor or speculation from EA Sports. "It seemed like if we didn't react, the message out there got doused before anything got to the point where we'd be concerned about it," Ross said. Inside EA Sports Tiburon, it was still cloak-and-dagger. The studio had been burned back in 2008 when a listing on the Entertainment Software Ratings Board's web site betrayed a Wii title called NASCAR Kart Racing before it was announced. Stung by that experience, the development and PR team built up the fiction of "Madden Playbook Creator," which not only would serve as the "working title" it sent in to the ESRB, it would be Blitz's in-house name, to keep loose lips from sinking another ship. "We have internal systems in here that have an audience," Ross explained. "There are people in here who can see all of this stuff, and someone in a different studio may see 'Oh, they're working on NFL Blitz and then word gets out." Maitland, Fla.-based Tiburon's isolation from games development's power corridors in Silicon Valley, Texas or the Pacific Northwest, also helped keep things quiet, Ross said. "I've worked in an area with a lot of different game companies within 5 or 10 miles of each other, and it seemed everybody went to lunch at the same place," Ross said. "You could be in the checkout line, and somebody would be talking about the game they were working on, and without realizing it, they'd give away confidential information." The ESRB is a different story. A quasi-public agency set up by the Entertainment Sofware Association, it provides public listings not only of games currently in circulation, but also of upcoming releases. Indeed, it's a parlor game among the speciality press to watch the ESRB site and out the next re-release of a classic console game on PlayStation Network or Xbox Live, which will both distribute NFL Blitz when it arrives in January. EA Sports says it didn't lie to the ESRB; it sent in an early submission under the working title "Madden Playbook Creator." That sounded like another piece of downloadable content from a label notorious for selling it. But the content description for "Madden Playbook Creator," had anyone bothered to look, definitely meant it was Blitz. "We held nothing back from the ESRB with regard to the description of the game," Ross said. "We never referred to it as NFL Blitz but we certainly told them it was an NFL-licensed product, it was an arcade-style game with 1st down and 30 to go, seven-on-seven and guys catching on fire. But its 'working title' was Madden Playbook Creator." This preliminary listing wasn't fully public. Reading that description would have required membership in the Electronic Software Association, the trade group that has set up the ESRB, the U.S. ratings board. "Anybody who would have had permissions and rights to go deeper would have seen it," Ross said. They didn't. Though the certificate has yet to appear in the ESRB's public listings, the promotional trailer EA Sports sent out for NFL Blitz on Tuesday says the game is rated E10+. There still were close calls and whispers inside Tiburon, Ross said. For research, the team wheeled in a giant NFL Blitz arcade cabinet, which should have raised eyebrows. Ross and the "Madden Playbook Creator" team laughed it off and put it in a rec room, explaining away the cabinet's presence to Turmell joining the studio. Old Nintendo 64 consoles with original copies of NFL Blitz were also brought back to study gameplay; they had to be kept behind badge-entry doors back in the Blitz team's end of the studio. One day, Ross was in a conference room working by himself, with all sorts of NFL Blitz material strewn about on the table. The conference room doors have a glass pane. A tour group walked by, Ross said, and its guide told the group he was working on NFL Blitz. He got up, politely addressed the group (a private gathering of industry professionals), and reminded them of the non-disclosure agreements they signed before starting their tour. When they left he sat back down and took a deep sigh. Maybe it's because of the genre—fewer gamers, per capita, watch these kinds of developments in annual sports titles, where sequels are assumed every year and licenses are typically held by a single developer. But EA Sports Tiburon could conduct a Harvard Business seminar on pre-release secrecy. Its finest hour was back in January, when the first anyone heard that The Masters and Augustal National Golf Club were coming to the Tiger Woods PGA Tour series was the day EA sent out the word officially. Yet in that case, the label had outside partners well versed in discretion and secrecy. 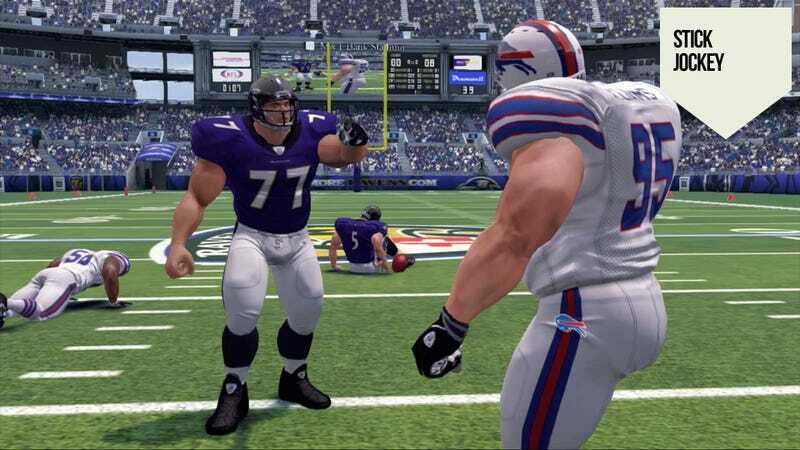 With NFL Blitz, EA Sports was picking up the pieces from a bankrupt company, whose liquidation was a matter of public record. For more than a year, Dave Ross was worried Blitz would become an open secret at any moment. Now he doesn't have to worry. Now he can tell his kids what their dad's really doing at work.